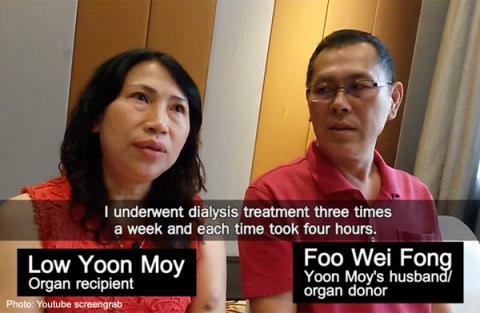 PETALING JAYA – Trader Foo Wei Fong felt helpless watching his wife suffer during dialysis sessions three times a week and wished there was a way he could help her. The 52-year-old wanted to donate a kidney to her but doctors told him this was not possible as they had different blood groups. But when they heard that specialists in Kuala Lumpur were now able to do kidney transplants for people with different blood groups, they decided to go for it. “We did not think twice. We had to go through some tests and within six months the procedure was done,” said Foo. Low Yoon Moy and Foo have been married for 29 years. The couple, from Changlun, Kedah, have three children and all of them have registered to be organ donors. Low was first diagnosed with kidney failure 10 years ago and underwent three years of dialysis before the procedure. “I am so grateful to him and I love him even more now for what he has done for me,” she said at a gathering of kidney donors and reci­pients organised by University Malaya Medical Centre (UMMC) to celebrate 40 years of kidney transplants. “Blood group incompatible or ABO-incompatible kidney transplantation is relatively new in Malaysia. “We need to spread the news so more people are aware of this. Low is actually our first ABO-incompatible case,” UMMC Nephrology unit head Prof Dr Lim Soo Kun told reporters yesterday.